It has been a while since I haven't visited Jaan... in fact I didn't get a chance to dine there since Chef André left. Recently, Chef Julien Royer took charge of the kitchen moving from his previous job at the St. Regis Hotel. 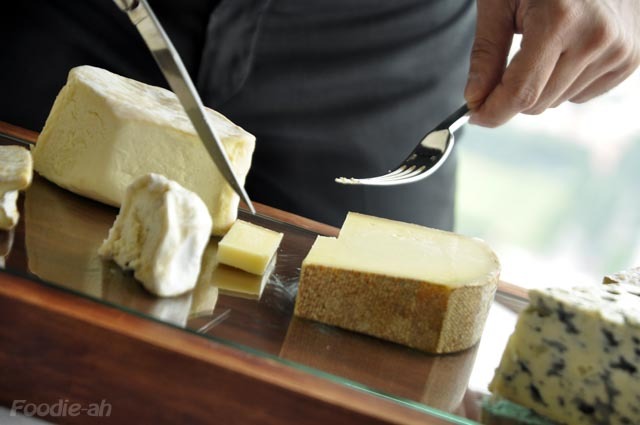 While the food at the Brasserie "Les Saveurs" was more classic French, at Jaan Julien has been given more freedom to present his own creations, while sourcing products from his selection of world class producers. Having beautiful memories of the great food that Chef André used to serve at Jaan when he first started, I was very excited to try their new food style for lunch. The dining room hasn't changed, which is a good thing for me, since I believe it's one of the most tastefully furnished fine dining restaurants in Singapore. 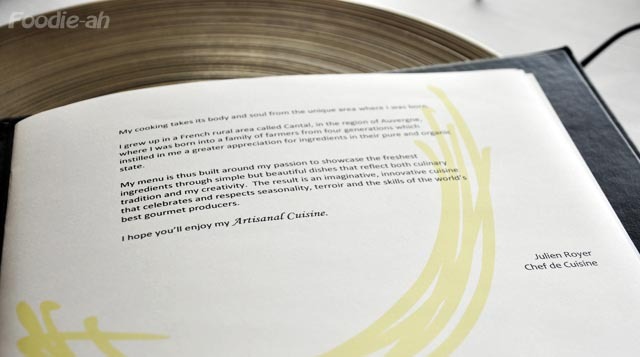 The menu includes an introduction of the Chef's background and his mission statement. I like it as it's really a no-frills introduction, simple and concise. He believes in tradition, combined with creativity and fresh ingredients from the best producers. 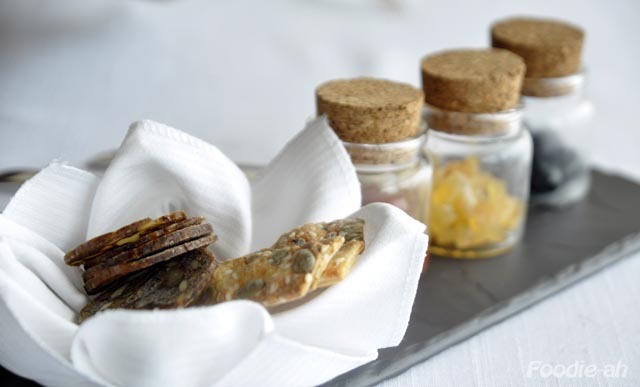 Right after ordering the food, we were served an impressively presented thin bread with a "lentils hummus", the Chef's personal interpretation, made from Saint-Flour lentils and chestnuts. 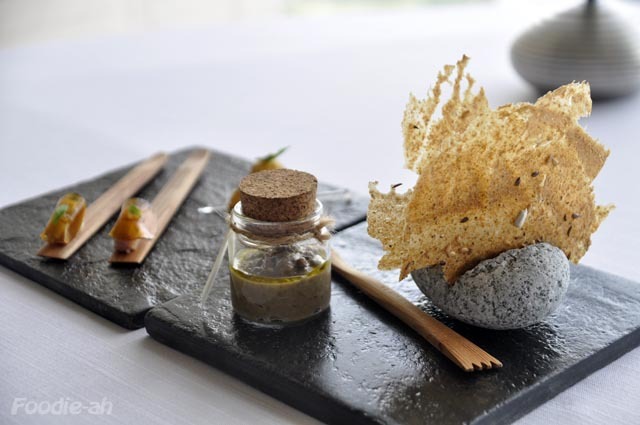 The presentation was both modern and artisanal at the same time, with a combination of stone and wooden utensils. Minimalist and warm. All the small bites that were served with the bread were beautifully presented and were absolutely delicious. The hummus was slightly sweet for me, as I prefer to start my meal with more savoury flavours. It was with great surprise that we discovered shortly after the amuse-bouche was yet to be served: a cep sabayon with fresh walnuts and lovage. It came served in a double-walled glass and it looked like a dense mousse. 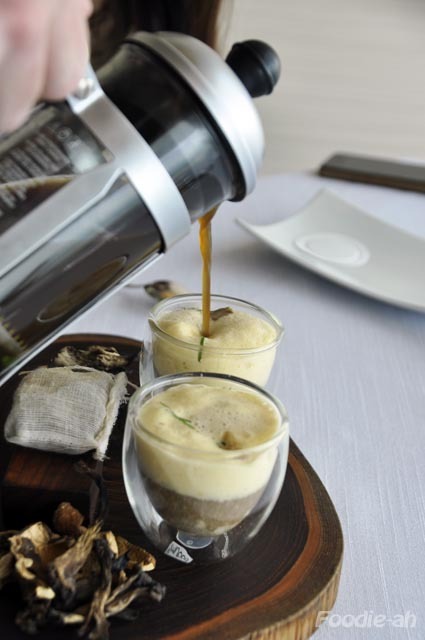 When the waiter poured an infusion of boiling wild mushroom tea right in front of us, the magic happened and the dish transformed into a mushroom cappuccino. 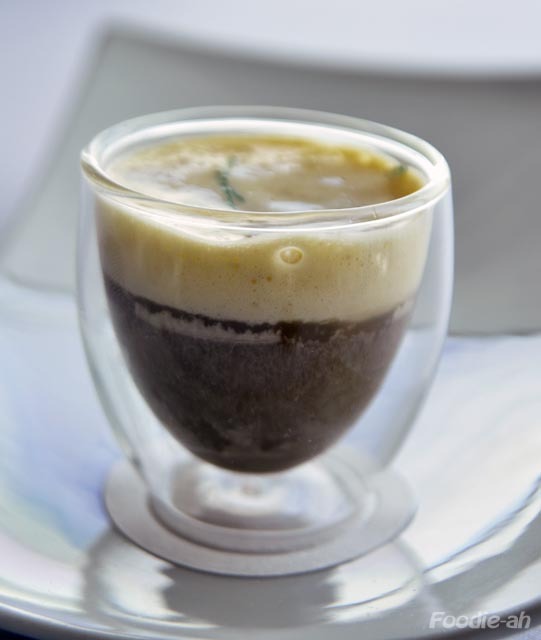 Flavoursome, hot, creamy, sophisticated and yet simple. I must say that with these two unexpected courses, the Chef already built a great momentum to the dining experience, and we were eager to find out what would be next. 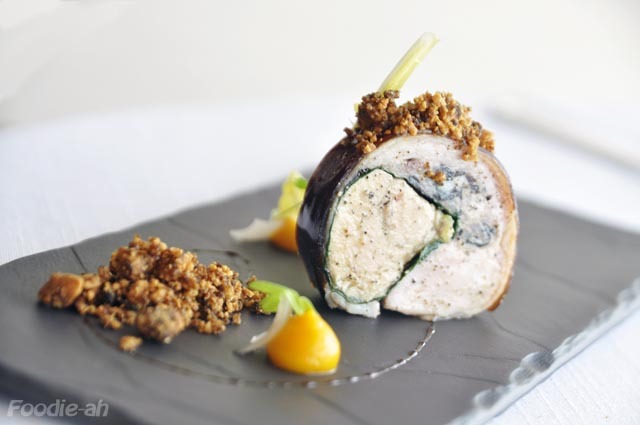 The Landes Foie Gras and Rabbit ballotine was a core of Foie Gras, rolled into rabbit breast meat, then again coated with a thin layer of lardo di colonnata to retain the moisture. Decorations of gingered butternut, hazelnut and pickled onions added dimensions of flavour and texture that could be combined with the protein. The other starter was pure indulgence: a large raviolo, stuffed with soft, oozing egg yolk, and topped with cheese and truffle, on top of a dense mushroom sauce. Once again, very elegantly presented, pleasant and balanced to the palate. The fresh hazelnuts added an extra seasonal touch to the dish, which unfortunately in Singapore we tend to forget and neglect. 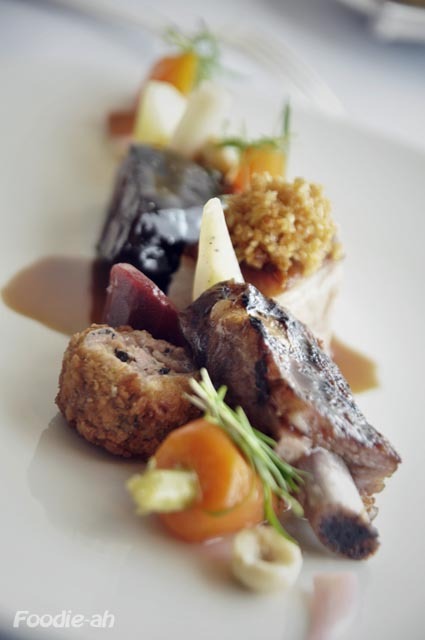 The main dish was an assorted serving of the most rich or flavoursome cuts pork: cheek, belly, short rib, pig's trotter. Unsurprisingly, the belly was the best, with those rich layers of fat and the unmissable crispy skin, followed by the cheek which was tender and coated in a rich glaze. I liked the distinct charred flavour of the short rib, which was quite lean and dry on its surface, but a delicacy that I couldn't resist from grabbing with my fingers and devour like a caveman. The pig's trotter was deep fried into a small ball in classic French style, which has never been my favourite way of having this delicacy, however this was the leanest I had so far and was overall quite pleasant. It is stating the obvious, but any pork lover would have to order this. 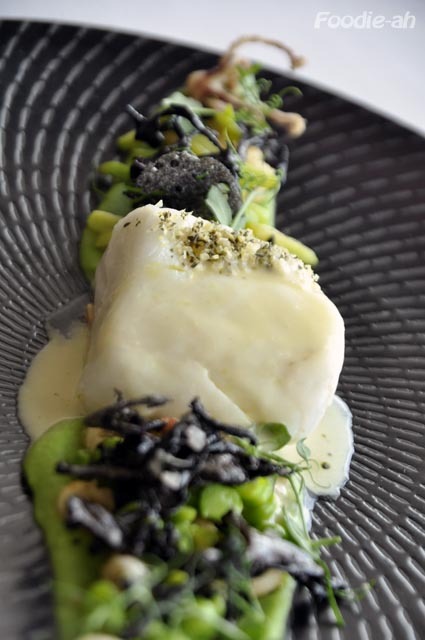 The second main dish was fish, for a change: an Atlantic cod with baby squid, Chanterelles mushrooms and summer beans. The fish was well cooked, moist and flaky. The beans were cut into strips and gave a bit of a light crunch to a dish that was otherwise mainly composed of soft textures. While most of the flavours on the dish were quite mild, they were compensated by the pieces of baby squid which were very savoury. The main dishes were certainly not disappointing, and the momentum was still up there. Then another surprise course appeared in front of us. 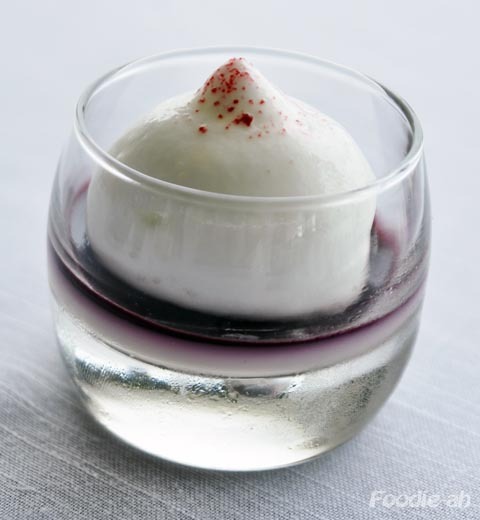 We were served a palate cleanser, which was essentially a blueberry pannacotta, topped with a 2-temperatures foam. As one of the desserts, we tried the cheeses. There was a great cheese selection, with a couple of outstanding soft cheeses. I can't recall the name, but there was a special soft cheese that really had a buttery texture and intense taste I never encountered before in both French and Italian cheeses. The cheeses were accompanied by a selection of crackers and homemade jams, including delicious candied ginger which I wiped all out. My dessert was a "Choconuts": a Jivara mousse with peanuts and Macadamia ice cream. Clearly, one for nuts fans like me. The eccentric presentation, almost out of a futurist sculpture, somehow suggested I should start from the left (the ice cream), and then progress from the soft textures slowly onto the biscuit and chocolate wafer. Solid caramel, nutty, chocolate flavours dominated this quirky dessert. ...but that was not it! Final surprise, the petit fours. This presentation looked warm and cozy, yet again with a humorous, quirky touch: CaramBar candies! 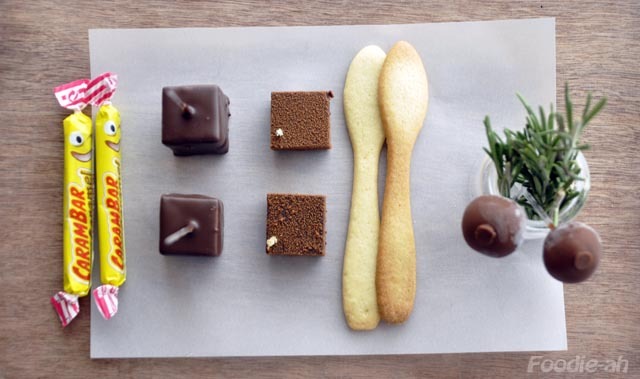 This rosemary based combination of sweet bites included chocolate coated marshmallows, truffles, buttery biscuits, and finally ice cream chocolate coated lollipops. In particular, I liked the rosemary infused melt in your mouth truffles and bouncy homemade marshmallows. I am always an enthusiast for fresh herbs in desserts and cocktails! In summary, this was an incredibly satisfying meal, full of surprises, excitement, a beauty for the eyes and the palate. In particular, I was amazed by its value for money. 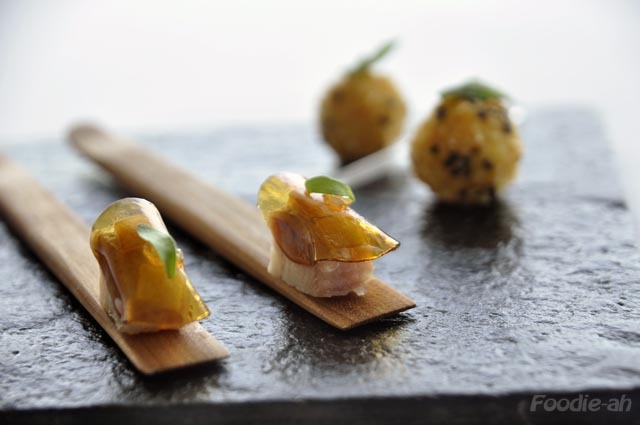 There aren't many places in Singapore where you can enjoy what effectively is a 7 course fine dining lunch (3 courses, + pre-amuse bouche, amuse bouche, palate cleanser and petit fours) for just S$52++ per person! On top of the great food, service is always excellent at Jaan, with competent, discreet and attentive staff, and the bright, spacious, breathtaking dining room is certainly a plus for any diner. I heard it was good. I didn't realised how good. What a delicious show! Thank you. Have to say the food look really good. Going to have to try it someday as well! What a wonderful review. Great blog. I am so thrilled to discover it. Aun - Thanks for the compliment, that's very flattering when coming from the best food blogger in Singapore!